Reso-workshop lead by Fabian Thomé starting by a training then, repertoire from the creation FRACTUS V from Sidi Larbi Cherkaoui. Fabian was born in 1981 in the south of France (Saint Jean de Luz) where he made his first dancing steps at age 7, in the Catalina Gómez school. In 1999, driven by his passion, he continued his training at the Real Conservatorio Profesional de Danza in Madrid, graduating in Spanish and Flamenco Dance in 2004. In addition to his talent as a dancer and performer, Fabián began to create his own choreographies, teaching his style. In 2006, he presented his first show at the Andalusian Festival at Saint Jean de Luz (France) and since then has offered original creations. Recognition of his work came in 2009, with the 2nd Prize for Solo Choreography and 1st Prize for Photo Scene for Así me siento at the XVIII edition of the Spanish and Flamenco Dance Choreography Contest held in Madrid. 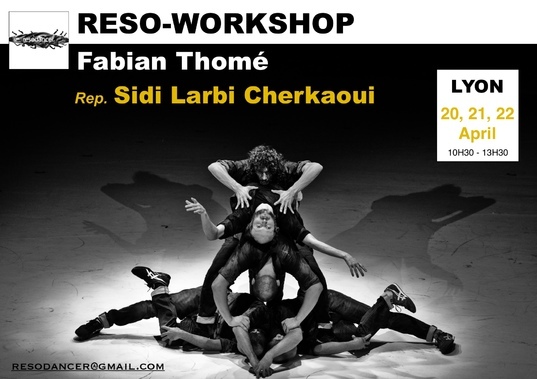 In February 2015, Fabian was part of the last production of Arantxa Sagardoy and Alfredo Bravo – Sibil.la – in Switzerland and in June 2015 he joined the new production directed and choreographed by Sidi Larbi Cherkaoui, Fractus V.